Let’s start a mental experiment, starting with the earth as it can be seen from space, with time come to a halt. For the purpose of experimentation, that is the initial design of interest. Next let’s imagine having an instrument to observe. What can be seen through the eyepiece determines the whole, at the start the whole earth. What can be subjectively considered the significant structure of the whole, is the architecture. When zooming down, the “whole” boundary changes. What can be subjectively considered the significant structure relative to the newly determined whole, the architecture, changes too. The instrument provides an infinite zoom capability. Zooming down can continue, down to continents, countries, cities, buildings, ultimately to the atomic level and even beyond. All in all, the overall design i.e. the whole of the earth down to its tiniest part wholes does not change at all. Architecture is thus the sum and the part because as one zooms in and out ultimately everything is covered, all design. Architecture is design, design is architecture. Two weeks ago, Ruth Malan (@ruthmalan) of Bredemeyer Consulting and contributing author to the Cutter Consortium commented in her online journal (being maintained since 2006 and recommended!) that between the metaphor used by Tom Graves (@tetradian) in Agility Needs a Backbone and what I covered in Architecture and the Remainder of Design, there is a great way to talk about architecture and agility. In Architecture and the Remainder of Design and further comments, I argued that architecture provides an agility distribution instrument; that architecture is inherently not agile but simultaneously an instrument to push desired variation points out, to the boundary with or into agile territory. Likewise it is an instrument to inhibit non-differentiating change, by burying the opportunity. Actually, to quote Dana Bredemeyer (@DanaBredemeyer), one can “prune the opportunity tree”. In Enterprise Agility, an Attempt to Get to the Bone I shortly covered the apparent paradox that agility also increases by reducing change, albeit the non-differentiating change, thereby leading to “leaner” structure. Clearly I am using the word “lean” here only as an adjective, a marker, no decorated meanings intended! Leaner structure is more coherent, carries less weight or — using a better word — mass, thus eases coordination, and so enhances the ability to move quickly and easily. In fact, both “desired” and “non-differentiating” change options need to be addressed and to be brought in balance and that is what agility distribution is about. One could think that a start-up, with a small team and hardly any structure, with a lot of things happening by self-organisation (which in fact turns into structure too), is the summit of enterprise agility. But without much rigid structure, it is missing “non-differentiating” change being addressed, more often than not painfully experienced as soon as the start-up grows bigger and has to start fending off contenders. Simply put, there is hardly anything to balance the variability with. There is hardly any distribution that can be done. Thus no or little structure does not make agile! It offers plenty of room for change but hardly any quick and easy amplification of coordinated, directed change. 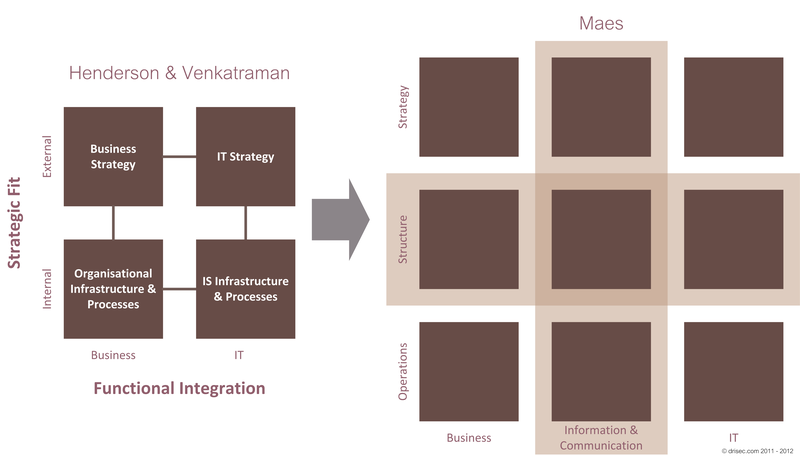 Indeed, Agility Needs a Backbone and it is architecture that can provide that, in fact architecture is that backbone! Of course, not withstanding all engineering (attempts), structure and the distribution thereof can be (partly) emergent. It may be what we simply find and often is. It may not be readily apparent, (partly) hidden in its complexity, something one can never be fully aware of, and not necessarily be well aligned with what is desired. But it will have specific quality characteristics nevertheless! Much of the confusion about agility originates however from the unawareness of different orders of agility. All the above is not presenting the whole picture. What I tackled in Architecture and the Remainder of Design is about 2nd order agility, agility as a quality or state, the distribution of structure as it is that defines the rigid backbone and the set of variation points. The praises that for example the cloud receives is about 2nd order agility. But 2nd order agility in itself is useless if it is not aligned with and for a higher purpose: 1st order agility! If it is not, it simply adds to the non-differentiating change options and is counter-productive. I have a particular interest in the structure layer that Prof. Rik Maes positions rightfully between strategy and operations. 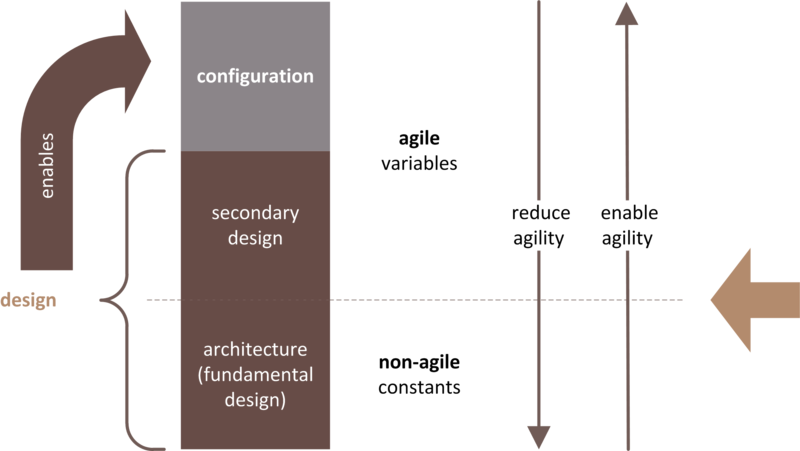 2nd order agility is represented by architecture and the remainder of, secondary, design. 2nd order agility determines the configuration set in support of 1st order agility. 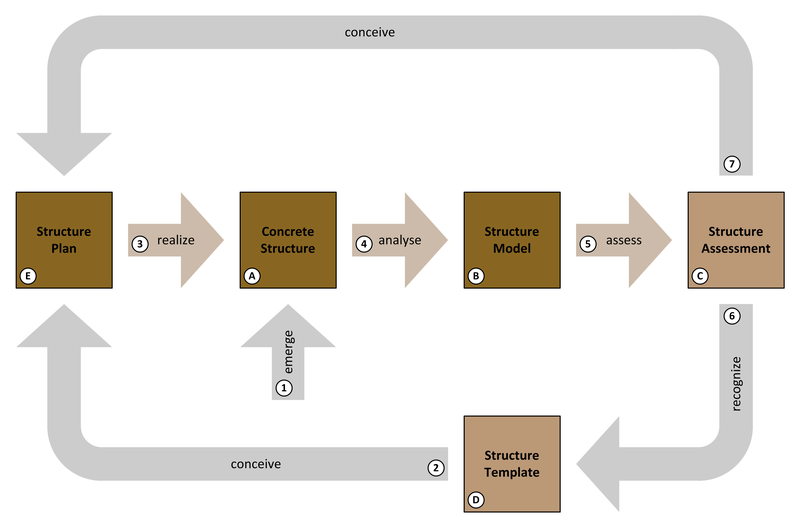 Many organisations neglect “real” enterprise architecture because it takes so long before benefits start to arrive — and thus much doubt exists if they will ever arrive — but surely miss grand opportunities: configuration and secondary design can never generate the abrupt or quick effect that they could potentially have. The backbone is lacking. What is 1st order agility ultimately offering? Hopefully both strategic and operational agility. In a next round it determines the territory that can be explored for doing “right” things as well as the territory that can be exploited for doing things “right”. These round-trips ultimately determine how wholes, e.g. enterprises, are able to grow, improve and adapt over time, or collapse. Architecture has the potential to be the instrument to fixate the principles, either the aspiration for reliability in maintaining specific constants, or in maintaining specific variables, in a coherent manner. 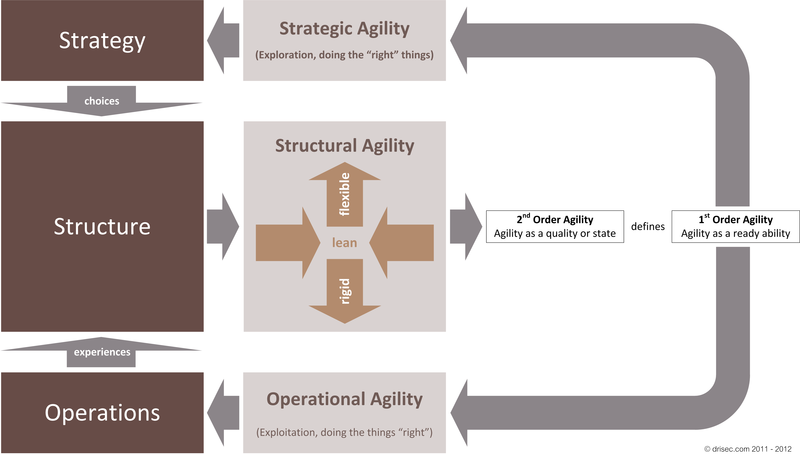 So in conclusion: agility = structural agility (2nd order) + strategic agility (1st order) + operational agility (1st order). And architecture is the backbone. In the one comment made to the earlier post Architecture in Context [Revision 1], different aspects are put forward that I also see as key elements in a defining story but in quite different ways as proposed. All architecture is design but not all design is architecture. Is there any primacy in these parts? Where does architecture end and the remainder of design begin? In the comment referred to above, is stated that Grady Booch meant to differentiate otherwise, between objective/subjective aspects. No doubt the objective versus subjective stand towards fit-for-purpose is an important element in a defining story – one that I will later come back to – but I disagree that the concern is what differentiates design from architecture. It plays a role but in an other way. In fact, I cannot find any proof of Grady stating so. Moreover, there is a well-known addition to the quote by Grady Booch (original reference) that points in quite a different direction. Architecture represents the significant design decisions that shape a system, where significant is measured by cost of change. That more or less has always been my understanding and has a consequence. It means that the part representing architecture is a relative notion. Significant means “significant when compared to the cost of change of the whole”. I’ll present an example taken from the tangible world, to clarify. If urban architecture is your perspective, the architecture of one specific building is usually not significant. It is therefore part of the remainder of design, at least from that perspective. If only the building is your perspective, architecture is made up by a part of a whole that in the former perspective completely ended up in the remainder of design. Grady Booch refers to significant “cost of change” which seems to point to financial measure. I believe that such an understanding is too restrictive. The latter specific barrier is a reason why most cities have retained old structures over centuries but Paris is an exception. Napoleon III had not only a considerable amount of power at his disposal but was also a good communicator, hence he succeeded in acquiring the necessary empowerment, to have realized what has been referred to as Haussmann’s renovation. Hence significant in this context also means that such a change when started abruptly and incautiously is likely to cause anything close to destruction and subsequent recreation with the newly desired fundamental structure. In between old and new, the action would cause the whole to be significantly non-operational. Architecture itself is that what is inherently not agile. The remainder of design is that what is inherently agile. Although architecture is “the” prime enabler of agility, architecture itself is that what is inherently not agile. drisec.com by Kris Meukens is licensed under a Creative Commons Attribution-NonCommercial-NoDerivs 3.0 Unported License. Based on a work at drisec.com. Permissions beyond the scope of this license may be available at http://drisec.com/permission.